I know it has been a while - I have been in the process of emigrating to Adelaide and it has therefore been rather a manic time...but things are starting to settle down and I have every intention of maintaining this blog as a place to find great, tasty vegetarian recipes. I have to say there is a much more limited range of Quorn available in Australia (I am finding so far) and also that it is VERY expensive. Around $6 (£4) for a standard bag of frozen pieces or mince - I have yet to find any of the chilled ranges either. We were aware from previous visits that finding decent Indian food - at least UK style Indian which is fabulous - is very difficult indeed. We have never on any of our trips found a curry house worth mentioning and in general the curries we have tried have been bland, watery and weird or dry and sauce less (much like Indian food in India but not the UK variant we are used to and love). It makes you realise how blessed the UK is with a fabulous British Asian identity and cuisine. So - anyway - after two more disappointing curries in the last week I decided that enough was enough and ad libbed this Tandoori Masala from what I know of cooking curries - I did it with loads of veggies I needed to use up but it would work equally well with a bag of Quorn pieces (just chuck them in frozen) although I would also add veggies to the quorn version for a bit of texture. Handful of chopped fresh coriander. or you could add a bag of quorn pieces and some of the above veg to suit - just use up what you have to hand. Chop the onions and stick them in a tbsp of oil on a low heat to sweat down while you finely chop the chilli and the garlic. I left the seeds in as we like it medium/hot but remove the seeds if you want it milder. Chuck in the garlic and chilli and sweat it all down until softened and fragrant. Add the curry paste - amount is approximate, I used about a third of a jar. It should be sizzling away, stir it around the onions etc into a thick paste. Let it sizzle for a few minutes until you can smells the spices out of the paste. Add the passata and give it a good stir, let it come back up to a simmer then add the coconut milk a little at a time (I did it in thirds) stirring in completely each time and bringing back up to simmer (doing it this way makes the sauce a very even colour). Add a can full of water and repeat. Now if you are using any harder veg which require longer cooking add them now (sweet potatoes for me) and bring back up to a simmer, leave for ten minutes simmering then add everything else, give it a good stir and simmer for 20-30 mins until your veg is tender (or your quorn is cooked through). Keep tasting it - does it need more chilli? A pinch of any salt? Right before you serve it stir through the chopped coriander and there you have it! 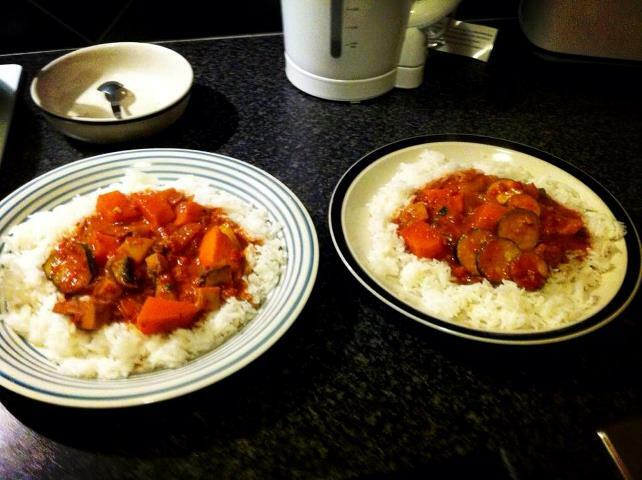 Easy, tasty, UK style curry. Enjoy!